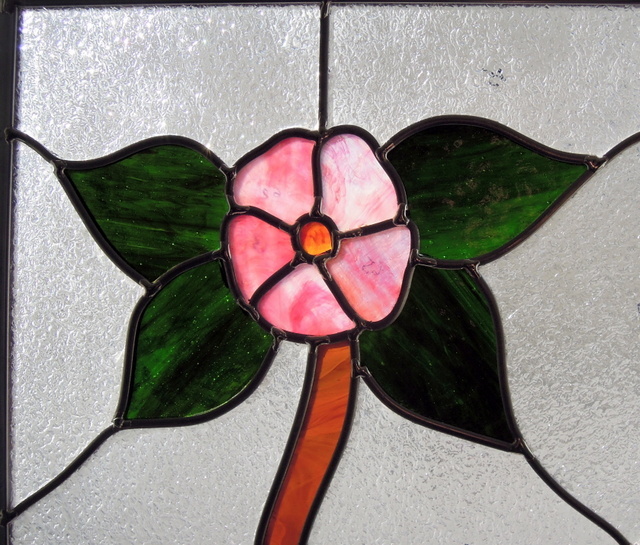 This is the 2nd Alberta Rose Came Window restoration. In the first one we combined pieces from the second one to have one that was all original glass. We believe these windows are 100+ years old. In the second one we had to put in all new glass for the stems, the amber across the bottom and new leaves for the left and right roses while the centre rose leaves remained original glass. 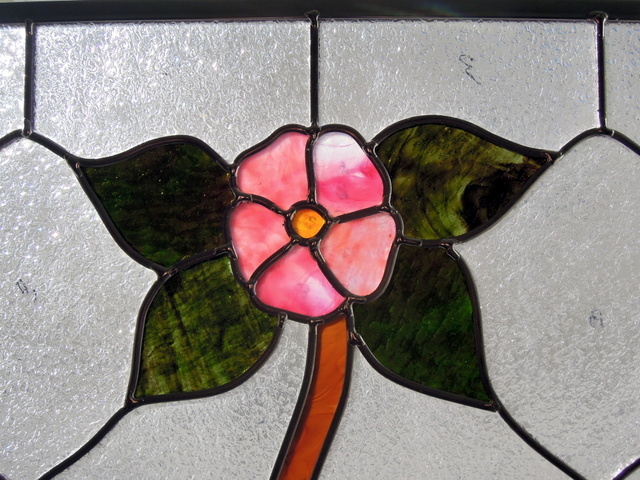 Also the roses and background granite clear glass is also all original. It took us quite sometime to find the best replacement glass, but well worth the effort. The following 3 photos show the left rose with new leaves, the next one is the centre rose all original glass and the last photo is the right rose with new leaves. The pink petals of the roses were a very pretty glass which was quite thick. 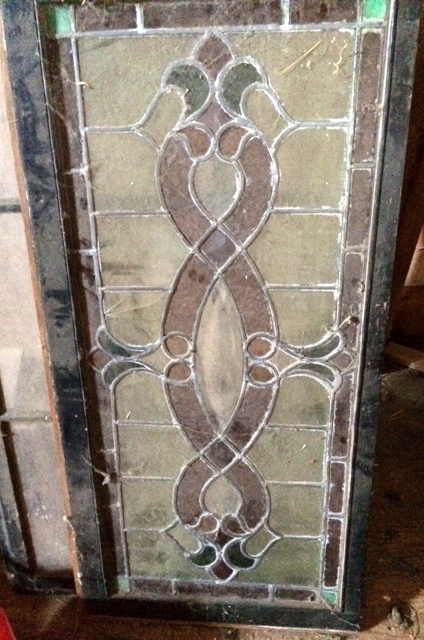 Although the next photo indicates window #1 it ended up being the second one as we took pieces from it to be able to have one with all original glass. The last photo is of the 1st restored window. 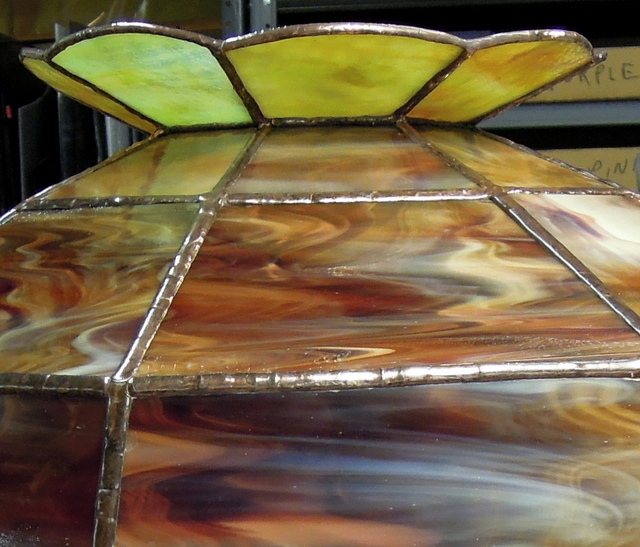 Clients in Central Alberta had this large Tiffany Style Lampshade, however it had been damaged and they wished to have it restored for over their kitchen table. 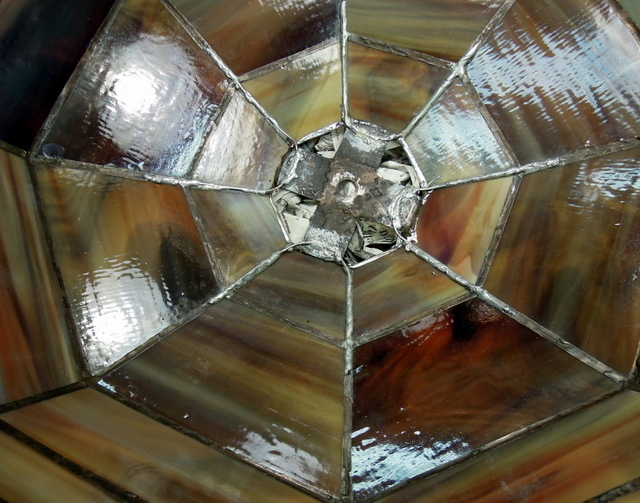 Fortunately for the lampshade the top ring of glass was bent flat down on the top of the shade but no broken glass. 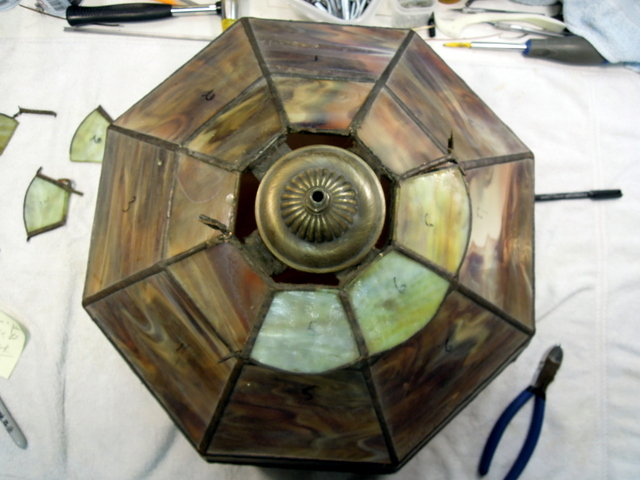 The next picture shows the inside of the lampshade before being reinforced with wire. 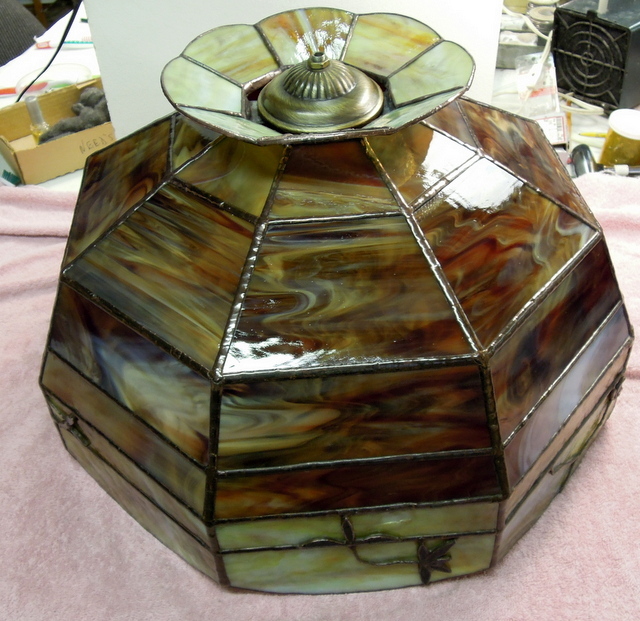 This was a very large Tiffany Style lampshade and was quite heavy. If these lamps are not properly reinforced they eventually will come apart and fall due to the heat generated from the light bulbs. Then the crossed centrepiece would pull away and send the lamp crashing to the table. 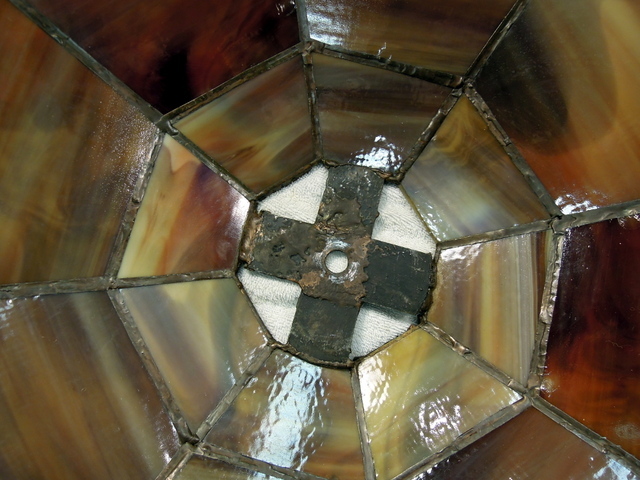 The photo below shows the removal of the top crown, also note the condition of the glass. Before taking the crown apart we number and photograph in detail to ensure that it all goes back together as originally made. One of the side panels was badly broken and had to be replaced. Unfortunately do to the age of the lamp it was impossible to obtain and exact glass match. To reinforce the hanging portion of the lamp we soldered in pieces of wire attaching them to the various seams along with the copper cross portion. The picture belows details the wire being attached and before the soldering was completed. 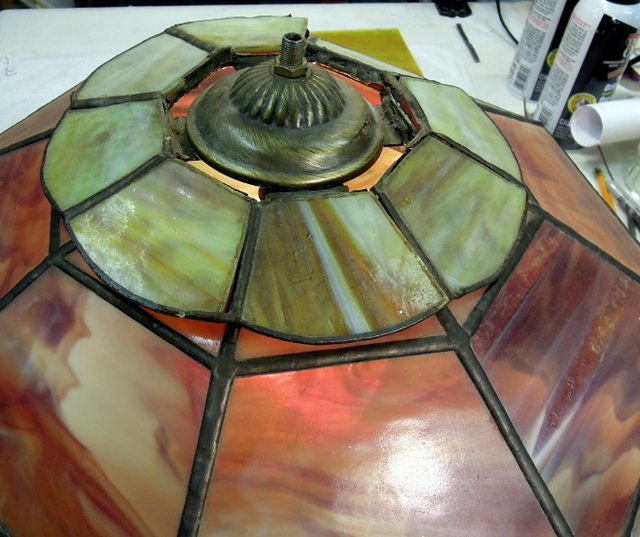 Before attaching the crown we cleaned and started the polishing of the lampshade. 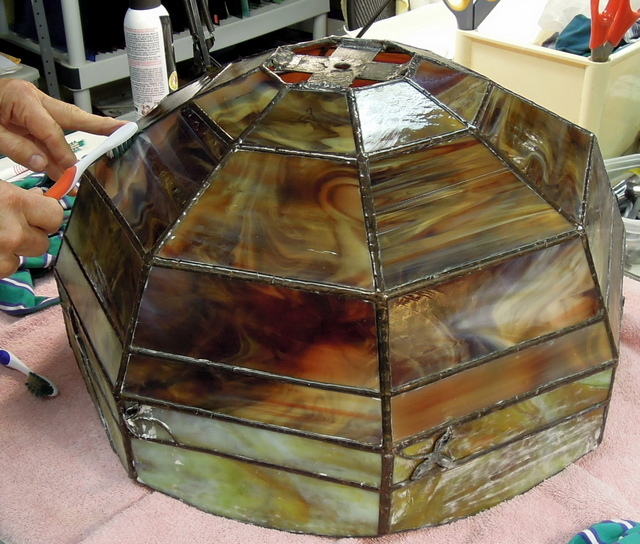 Here is the lampshade nearing completion. In the next photograph the top crown has now been attached and in the same original order. 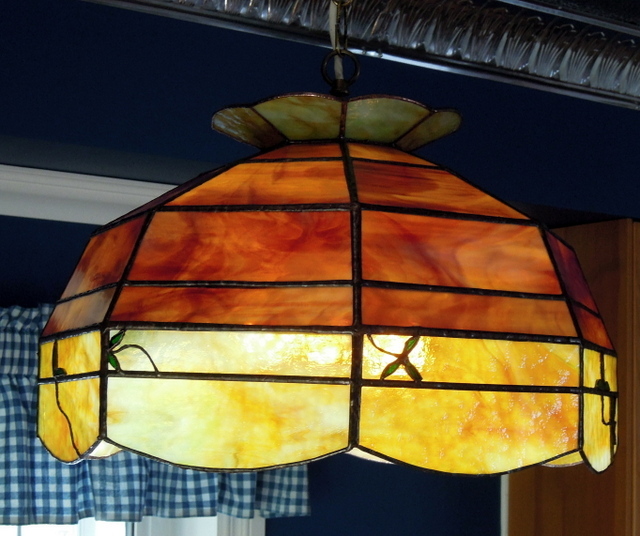 The fully restored lamp now hangs proudly in our clients home above their kitchen table. Brenda & her husband who live in Central Alberta, brought us this 100+ year old came window which is a family heirloom that they rescued from a century old family farm home. This is what the window looked like when it was brought to our studio. The following picture shows the window after it was cleaned and before removal from the the wooden frame. Unfortunately there were 3 broken pieces in the rose colored border, 4 greens in the center were all cracked and or broken along with one center clear. In the next photo the came window has been removed from the old wooden frame. In the next photo the numbered pieces # 2 top left – 4 top left center- 15 bottom right center (rose border pieces) 26 (clear center piece) 28 – 29 – 45 – 47 (the 4 center greens) were all broken. The best alternative we could come up for the dusty rose border glass was an English Muffle Dusty Rose #4902. Our friends at Rubaiyat Stained Glass Studio in Calgary helped us to locate an older piece of clear as well as a very close matching green. 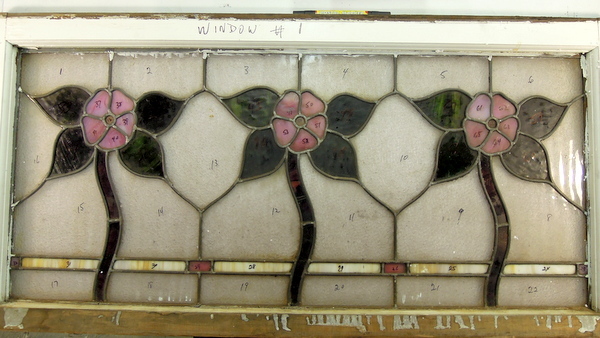 We take lots of photographs of these old windows before taking them apart, as well we number each piece. We set up a frame then start in one corner and work our way across the window, cleaning each piece of glass as we go along (we also re-number after clean each piece to ensure that it is put back in the window in the exact manner that the original stained glass artist installed them. Having good photographs certainly helps as we can bring them up on our computer to ensure that we have replaced each piece as it was originally placed in the window. What we did was replace the 4 corners with the new English Muffle #4902, then carefully working with 2 of these unbroken border pieces we used them to replace broken border pieces # 4 & 15. The 4 green pieces in the center were also replaced and the 4 center clears were all replace to even out the look of the panel. 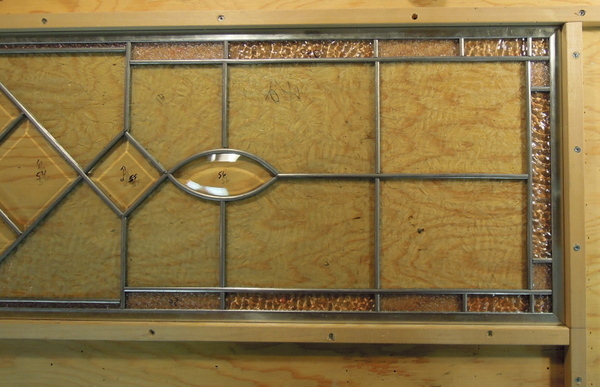 Our clients were most appreciated of our work in restoring their family heirloom panel. They have now found an old photograph of the 100+ year old farm home and it shows 2 of these windows. They plan on residing it and there is a possibility that the 2nd window could still hidden away behind the siding. If so and they find the 2nd window there is a very good chance that it might be there in its original state with no broken glass, but no doubt will need to also be fully restored. 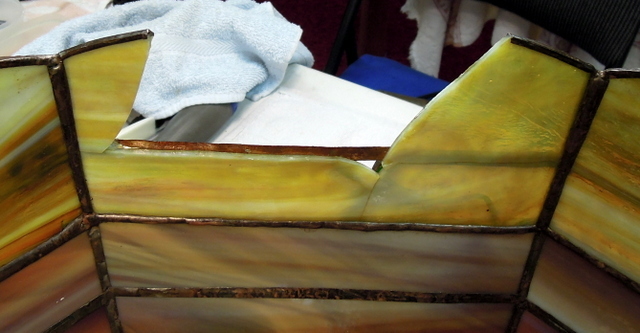 This is a sneak peak of the 2nd very old came window restorations that we are doing for a museum. Unfortunately due to the damage we had to find some similar colored glass for the centre portion as it was impossible to find matching glass for such an old window. The first picture shows the window before restoration and the second picture after completion. In due course we will be providing a very detailed account of these windows. 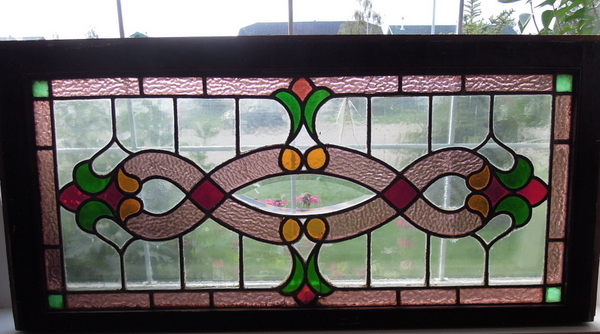 We still have 1 more to do which fortunately has no broken glass, along with a fairly large stained glass door insert. As you can see from the above photo the window was in extremely poor condition. The above photo shows the completed restoration, and it was safely transported to the museum where it will go on display. We have no idea who constructed these windows originally, however have a reasonable determination as to their age. For many years this very old came window rested secured under a bed. It measured 16 inches high by 40 inches wide. Was in poor structural condition as well had numerous lightly colored broken border pieces. Our clients had just built a new home in a smaller Central Alberta community and wanted to have it restored to go into their new transom window above their front door entrance. 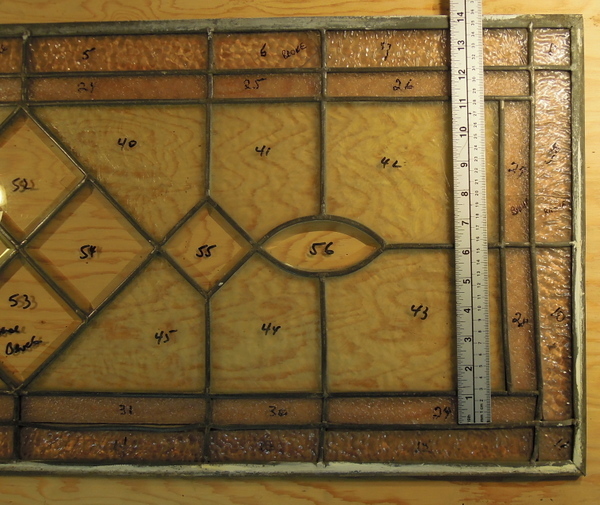 But the new transom window measured 12 inches high by 49 inches wide, so we had to redesign the window to those measurements, as well as come up with a design that would use the existing glass. The following picture shows the window in it’s original condition. Before we start a came restoration and after taking the initial photo we then number each piece and photograph the window again. Then we proceed to carefully cut away the rotten came and sort each piece by color etc and place them in separate boxes – beer flats and smaller soup can cardboard flats work well as it provides lots of room to spread out the various varieties of glass. We used to clean each piece and renumber but found that was more time consuming than just cleaning each piece when we are ready to use it in the reconstruction process. The next 2 pictures can give you an idea as to how much we had to stretch the length from 40 inches to 49 inches as well as shrink the height from 16 inches to 12 inches. 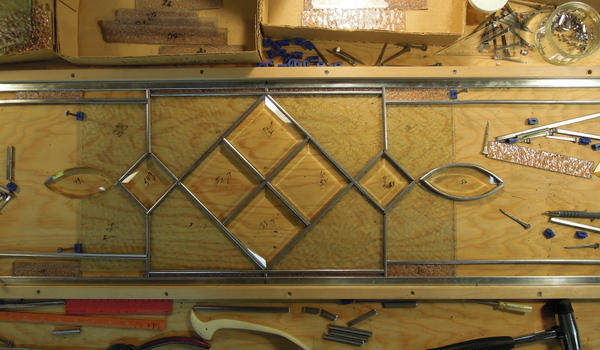 These measurements also included the new 1/2 inch came frame. 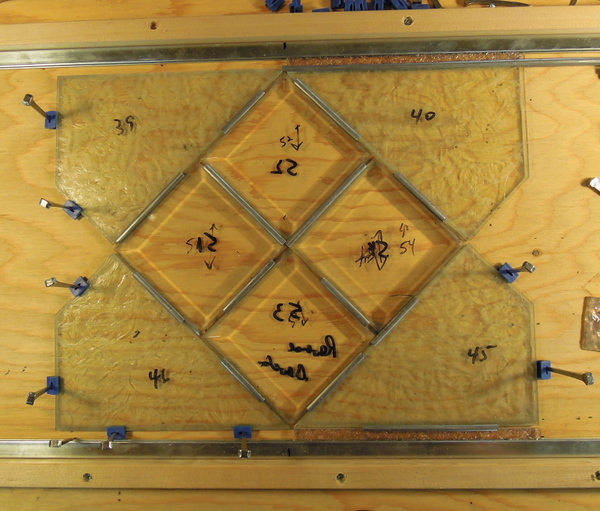 We use a piece of 3/4 inch plywood for the base and make the frame from hickory hardwood with intermittently placed drill holes, then using fine wood screws we attached these frames to the plywood base. You can see that we had to be creative to figure out how we would have enough of the colored border glass to go around. After numerous measurements to ensure final fitting accuracy, we built the wooden frame, miter cut the 1/2 zinc came frame and started the rebuilding process. The following picture shows the start of the redesign process. In the next photo we have expanded the left and right sides of the center bevel cluster, along with enlarging the colored border. The following 2 photos show the completed redesign first the right side and then the left side. 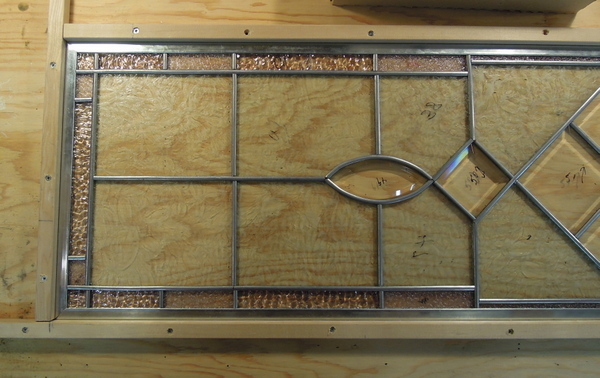 In the next photo the redesigned window is ready for joint soldering, cementing, whiting, then patina and polish. In the next picture the window is finished and ready to be taken to our clients. After soldering the came joints (cleaning the flux with Kwik Clean), cementing, cleaning with whiting, applying black patina to the came, cleaning again with Kwik Clean and applying polish, followed by lots of further cleaning, polishing with soft rags, along with using tooth brushes and X-acto knives to pick away any missed cement etc. we then have a beautiful window ready for our clients. Here is the window installed in it’s new home location. 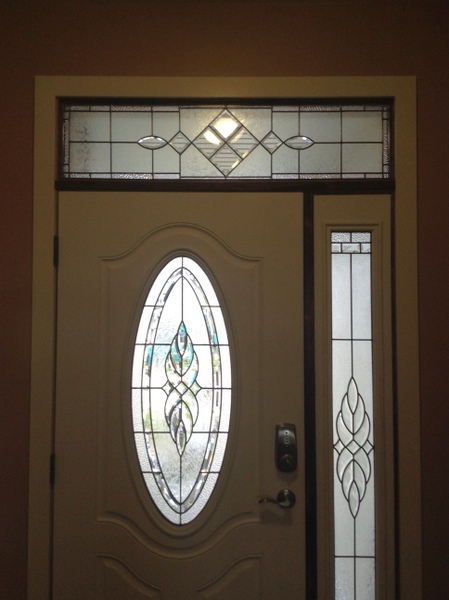 Our clients were more than pleased with the results and how it fitted into the new transom window opening along with how it complimented the new door and sidelight beveled panels.